Format: Audio CD / 58 min. Maybe they knew this show was going to be airing late at night. Planned or not, no matter how exciting Heat Guy J turned out to be for its viewers, this music can easily keep the most sleep-deprived viewers alert and interested. If only my homework had a soundtrack like this. 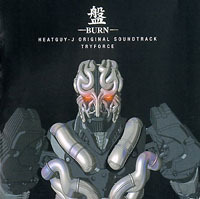 Merely among the beginning of Pioneer's flood of domestic versions of import CD releases, Burn is the original soundtrack that accompanies Pioneer's simultaneous release of the first DVD of Heat Guy J. By the time you read this, you may be able to find this CD in mainstream music stores everywhere. While this isn't the exact same thing as importing the original Japanese version, for me, there are two primary differences. One, you should be able to pick this up for as inexpensive as $14.99. Two, assuming you're a no-go with Nihongo, you have no need to break out the old Japanese-English / Kanji dictionary combo and spend hours translating track titles and liner notes. If complete authenticity to the source material is your thing, then by all means, shell out three times as much money to import the CD and translate the disc to your heart's content. I have nothing but respect for diehard fans. In the meantime, I'll be picking up Pioneer's domestic release of the Chobits soundtrack and debating whether or not I should buy a domestic version of my Cowboy Bebop soundtracks (even though I already own the imports) should they ever magically become available. Oh, and don't get me wrong - this release is magical. Other...well, to borrow the name, pioneers such as TOKYOPOP, The Right Stuf, and ADV have already released domestic editions of anime and game soundtracks that are still available out there. However, there is a key difference between those releases in the past and Pioneer's now. Not only is the CD an almost exact replica of the Japanese version (save for the English translations), but it is also far more available than other soundtracks previously produced in America. I order things online all the time - just ask the cool people at TRSI and Animenation - but there's something really nice about being able to walk into a Best Buy and see anime soundtracks glistening in the store's life-sucking soulless lighting. I'll still buy these CDs from the places I respect, but it's nice to know that the mainstream public now has no excuse not to get them. So, now that we have all of that out of the way, how about the CD? The cover features the CGI model of J, the super-powered android law enforcer, in his naked (that is, skinless) glory. On the back, we get a track list and a scary, Terminator-esque shot of J, with half of his face covered in skin and the other showing the metal underneath. The songs themselves remind me quite a bit of the style of Cowboy Bebop, but only insofar as there is such a multitude of dissimilar styles here mixed skillfully. There isn't as much classic American jazz as Bebop, but there are traces of Celtic, Funk, Techno, Japanese, Italian, and even a hint of Indian sounds to be found within this acoustically impressive blend. As with Cowboy Bebop, Hellsing, and Bubblegum Crisis 2040, what really hooked me on this CD was the show's opening theme. For Heat Guy J, it was no different. "Face" gives a hint of the diverse musical talent of TRYFORCE, the team of four that composed and performed all of the music on the soundtrack except for Saeko Chiba's performance of "Hikari." TRYFORCE consists of Kenichi Sudoh, Yohgo Kohno, Yoshichika Kuriyama, and Hironobu Kageyama, for anyone who may be curious in the musicians' other works. The other tracks on the disc are also good, though I think a few in particular stand out more than others. Of course there's the opening theme, "Face," but "Tribe" (J's theme) and "Bay Side Slider" (J's fighting theme) are good enough to justify purchasing this CD. Track 11, "God Never Knows," is a suspenseful mix of traditional Celtic sounds with excellent techno music, and it brings back happy memories of my Final Fantasy IV album, Celtic Moon. Track 12, "Fragmentation," features some furious piano playing that left me rather impressed. I've always loved the sound of the piano, and this piece conveys the mood of a frantic situation so well it simply enveloped me as it maintained its powerful pace. After all of the techno and action music on the disc, track 19 ("Midtown Blues") was a great way to round out the CD. It begins with an airy acoustic guitar and slowly builds in intensity, but remains nice and folksy. Saeko Chiba also did an amazing job on the beautiful ending theme, the previously mentioned "Hikari." She can have a haunting voice when she wants to. There are some translation issues with the liner notes and even a track title (instead of track 17 being "Full Moon Selenade," I'm thinking it should actually be "Full Moon Serenade"). I didn't notice any actual errors with the liner notes, but they didn't read as well as they could have. However, they did seem to be a pretty faithful reproduction of the Japanese text within, and I personally find it rather cute when Japanese isn't translated into English perfectly. Others may find it funny, though, so hopefully Pioneer will work to have impeccably translated and written liner notes as their CD department takes off domestically. If you're a stranger to anime music, then you can do worse than choosing this CD as your first foray into the genre. There are more instrumental tracks here than vocal songs, but the energy and dynamic nature of the instrumentals more than make up for the lack of a singer. Fans of the show will probably get more enjoyment out of Burn than those who have never seen it, but it's good music no matter where you're coming from. If you have seen (and liked) the show, then this is an easy recommendation. If you haven't, I'd suggest you watch the show, for it's also pretty good. Then buy the CD. Even if you've already downloaded all of these songs, it would be a good idea to lend your support to the fledgling anime music CD industry by purchasing a disc or two when you get the chance. The industry is still in its infancy, but there's a bright future ahead if other companies give us high-quality products in the days to come.